Culinary artistry can be achieved by delicately balancing contrasts, and chefs spend their careers trying to pair the right combination of sweet and sour, salty and bitter, even crispy and tender. For Chef Joseph Youkhan of the Savannah Chophouse, this philosophy not only applies to cooking but also to life. The Chef is unwittingly a prime example of contrasts. Chef Joseph is a towering figure; at first glance, one might too quickly assume that he is the type that might fold you in half for looking at him the wrong way, but once he begins to speak, an unexpected mildness radiates from his imposing frame. Chef Youkhan was born in Yonkers, New York but grew up in the Bronx. A self-taught chef, Joseph learned the basics of the culinary industry from his father – a chef and owner of an Italian restaurant in New York. But rather than rely on what he learned in the kitchen, Chef Youkhan spent a great deal of time at bookstores pouring over cookbooks so that he could learn new techniques and refine the ones he had already learned. Around age sixteen, Chef Joseph left the Big Apple for a trip behind the Orange Curtain.Joseph held his first Sous Chef position at the Saratoga Grill, and then spent three years at the Ritz Carlton. It was during his time at the Ritz Carlton where Chef Youkhan feels that he transformed into a chef. He learned to take something as simple as mashed potatoes and elevate them to new heights. When patrons asked what was so special about his potatoes, Chef Joseph would simply reply that he used more salt, butter, and cream than anyone ever dared to use. This philosophy of using routine ingredients to elevate dishes to the sublime is a recursive one in Chef’s kitchen. 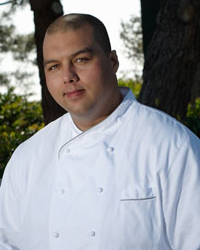 After working for the Ritz Carlton, Joseph became the Executive Chef at Chat Noir in Costa Mesa, and then became the Corporate Chef for Culinary Adventures, the company that owned Chat Noir. Eventually, he was given the helm at the Savannah Chophouse where he continues to use simple ingredients, like smoke, as background notes to his dishes that toy with the senses. Chef Youkhan would like to one day open his own restaurant – actually three. He’d like the restaurants to be chef-driven but offer food which will appeal to both foodies and casual diners, similar to that of the Savannah Chophouse. The food, he envisions, will be made up of subtle infusions designed to “blow the mind.” Even now, Chef Joseph runs the Chophouse as if it were his own. He not only spends the time in the kitchen to ensure that all of the dishes are exquisitely prepared, but he also finds himself frequently out on the floor making sure the guests are all getting a complete dining experience. He wants the food to evoke emotions. Joseph readily admits that the food is only one component of the ultimate experience. The decor, the linens, and the plating all affect the overall outcome of dining out. At the Savannah Chophouse all of these are in perfect culinary alignment. The decor insists it is a steakhouse, the tableware emits an air of sophistication, and the plating is flawless. When Chef Youkhan is not at work or reading about new recipes, he can be found at the gym practicing Brazilian Jiu Jitsu, where he holds a blue belt in the discipline. Oh, and he has a black belt in Eagle Claw Style Kung Fu. Yes, this gentle giant could in fact fold you in half for looking at him the wrong way, but, luckily, he is far from easily provoked. He also enters grappling and fighting matches similar to the MMA style fights on television whenever possible. However, the martial arts practice is but one caveat of the whole experience. He embraces the philosophical side of these forms of self defense which, he claims, give him the background notes to his life. As mentioned before, Chef Joseph is a prime example of a walking contradiction. One minute he speaks lovingly about his grandmothers, explaining with great intimacy how much he respects and loves them for cooking each meal for their families – labors of love for family and friends, he says. One of his grandmothers is Syrian and he says that any dish cooked with parsley and dill directly reminds him of her, and that his other grandmother of Puerto Rican descent often cooked with sofrito and how much emotion he feels when encountering those familiar smells and tastes. The next minute he talks about the various disciplines of martial arts he knows and the various fighting matches he has entered. If he were to never cook another dish in his career, Chef Youkhan would want to be remembered as a genuine guy who was able to touch people’s senses through food, and that the same philosophy had been used in the way he handled his employees, and his personal life. He believes that the act of feeding people is one of the most genuine and loving things someone can do since nourishment is one of the most basic human needs. For him to accomplish this while creating a total experience complete with piquing visual, emotional, and taste senses truly shows not only a culinary mastery but a mastery of himself. To view Chef Joseph’s Cedar Plank Salmon & BBQ Sauce recipe, visit our recipes page. WHAT IS YOUR ANNIVERSARY WITH THIS RESTAURANT? 1 year. WHAT IS THE RESTAURANT’S ANNIVERSARY? 11 years this year. AVERAGE NUMBER OF HOURS YOU WORK IN A WEEK: 60-70. FIRST COOKING OR FOOD-REALTED MEMORY: My Grandmother chopping fresh dill and parsley. Whenever I smell those herbs it reminds me of her. WHAT WAS YOUR FIRST JOB? Prep cook for my Father. WHAT FIRST INTERESTED YOU IN THE HOSPITALITY INDUSTRY? Cooking with my Father in New York. WHAT WAS YOUR FIRST HOSPITALITY JOB? Cook/runner/bus boy/whatever my Dad told me to do at Pizza & Brew. IF NOT A CHEF, WHAT WOULD YOU BE? Cage fighter. FAVORITE KITCHEN GADGET OR TOOL: Chef’s knife. FAVORITE TYPE OF COOKWARE: All Clad. FAVORITE CONDIMENT/SPICE: All types of salts. MOST RECOMMENDED KITCHEN TOOL AND SOURCE (ONLINE OR RETAIL SHOP) FOR HOME KITCHENS: KitchenAid stand mixer – Chef’s Toys. MOST RECOMMENDED FOOD INGREDIANT SOURCE (ONLINE OR RETAIL SHOP) FOR FOODIES: LaTienda.com. Very specific food items from Spain. BIGGEST MYTH ABOUT WORKING IN THE KITCHEN: That if you like to cook, you can do it. Professional kitchens take tremendous hard work and passion for what you do, as well as a lot of sacrifice. It is not for everyone. SIGNATURE OR FAVORITE DISH TO MAKE: Roast whole hog and pizza. OTHER CUISINES YOU’VE WORKED WITH: Literally everything. FAMILY INFO: Roenin and Kallin are my amazing boys. FAVORITE OC RESTAURANT: French 75 – Laguna Beach. FAVORITE DISH TO EAT: Sushi/sashimi. FAVORITE JUNK FOOD: Ice cream. FAVORITE FAST FOOD: In n Out. DO YOU WATCH FOOD TV? IS SO, WHICH PROGRAM(S) IS/ARE YOUR FAVORITE? Iron Chef, Top Chef, Made in Spain. FAMOUS CHEFS YOU’VE MET: Todd English. WHAT OTHER PUBLICATIONS HAVE YOU BEEN FEATURED IN? OC Register, Simply Delicious (featured recipe in cookbook), Bride Magazine, OC Metro. YEARS OF CULINARY EDUCATION: Lifetime of cooking. OTHER EDUCATION: My Father and other Chef Mentors have taught me over the years. PLACES TRAVELED TO EXPLORE AND LEARN ADDITIONAL CUISINES: Puerto Rico, Hawaii. WHAT THREE WORDS BEST DESCRIBE YOUR CULINARY STYLE? Craveable, rustic, fresh. YEARS IN THE BUSINESS: BOH: 25. PREVIOUS INDUSTRY EMPLOYERS: Chat Noir, Ritz Carlton – Laguna Niguel, Saratoga Grill, Mama Lucia’s. CHARITY AFFILIATION(S): Share Our Strength, Dolphin Force, Ocean Institute, Roosters. Heat the oil in a medium saucepan over medium heat. Add the shallots and garlic and cook until soft, about 4 minutes. Add the Bourbon, increase the heat to high and cook until reduced to about 1/2 cup. Add the ketchup and the remaining ingredients and cook until thickened and slightly reduced, stirring occasionally, about 20 minutes. Transfer to a bowl and let cool slightly. Brush salmon on both sides with canola oil and season with salt and pepper. Place on top of Cedar plank and place in oven for approximately 12 minutes or until reaches desired doneness (medium rare is preferred). Brush with BBQ sauce and place back in oven for 1 additional minute. Served with a scoop of Jalapeno Cheddar Potatoes.